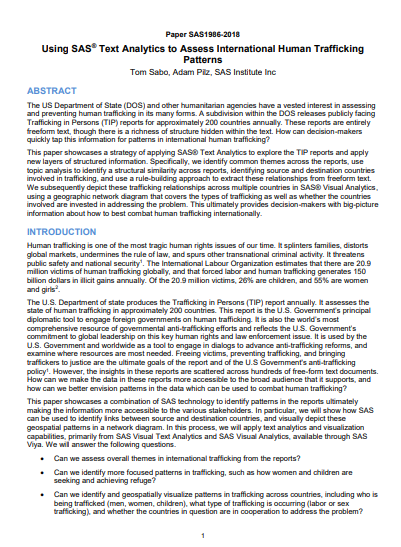 string(1182) "Resource Centre > Uncategorized > Using SAS® Text Analytics to Assess International Human Trafficking Patterns"
By Tom Sabo, Adam Pilz, SAS Institute Inc. The US Department of State (DOS) and other humanitarian agencies have a vested interest in assessing and preventing human trafficking in its many forms. A subdivision within the DOS releases publicly facing Trafficking in Persons (TIP) reports for approximately 200 countries annually. These reports are entirely freeform text, though there is a richness of structure hidden within the text. How can decision-makers quickly tap this information for patterns in international human trafficking? This paper showcases a strategy of applying SAS® Text Analytics to explore the TIP reports and apply new layers of structured information. Specifically, the authors identify common themes across the reports, use topic analysis to identify a structural similarity across reports, identifying source and destination countries involved in trafficking, and use a rule-building approach to extract these relationships from freeform text. The authors subsequently depict these trafficking relationships across multiple countries in SAS® Visual Analytics, using a geographic network diagram that covers the types of trafficking as well as whether the countries involved are invested in addressing the problem. This ultimately provides decision-makers with big-picture information about how to best combat human trafficking internationally.